Issays’s hypocrisy concerning Anti-Americanism and CIA. One of the political deceptions which the public should know about is Issays’s hypocritical anti-Americanism. 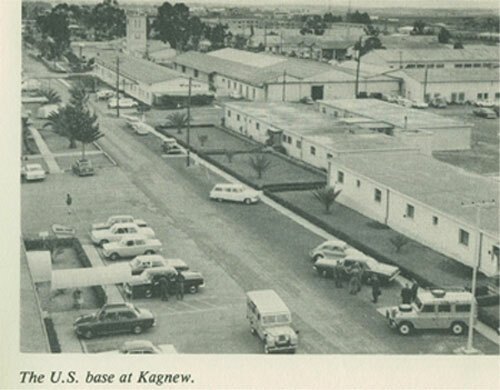 The story of Issays’s connection with the CIA goes back to April 1970 and to the Kagnew, US. base, in Asmara. After Issays came back to the Ala groups from the meeting he held with members of the CIA, he decided to split from the ELF. Because of this there was an argument with Abrham Twoldeo who was against splitting from the ELF, and over the talks with the Americans and the Ethiopians. After one month of arguments between them Abrham Twoldeo died(1) suddenly on 17 May 1970, which is still a secret for most of us.” Concerning this Erlich (1988: 97), states that one of Issays's main rivals in the rebel movement was poisoned to death. After Abrham Twoldeo death, Issays succeeded to the leadership of the group and then he took steps to split from the ELF. Regarding the story linking Issays and the CIA, most of the EPLF fighters who joined the Front in mid 1970s didn’t know about the secret meeting. And it would never have crossed their minds because there was a lot of campaigning against Imperialism and the CIA within the Front. The author of this paper still recalls when young students from Petogo in Asmara who joined the Front were accused of being CIA agents, and they were forced to confess in our presence that they were sent by the CIA. It was also intended to convince the new recruited fighters that the rumour disseminated by the ELF about the above meeting was groundless. It was designed by Issays to serve as an excuse for liquidating anyone who was a threat to his power during the period of the Menkaa movement. The Issays group spread the rumour that there were up to one hundred and fifty CIA agents within the movement (Megiesteab Kidane 2005:49). For example Tewelde Tesfamariam, who joined from Hamburg in 1972, was wrongly killed as a CIA spy. 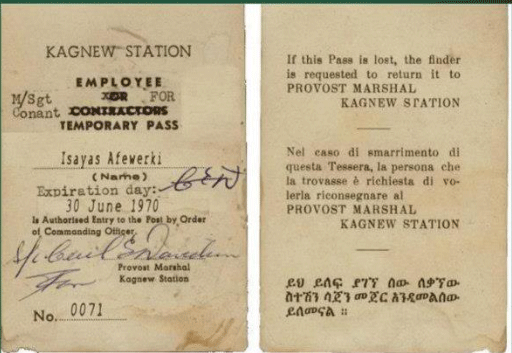 It was Tesfamichael Giorgio who first broke the news about the Kagnew deal in the Eritrea Liberation Front. He also presented a paper at the Massawa Symposium ’Secessionists and CIA Connection’ in 1982. This paper is available for public reference from: www.ehrea.org/TesfaMikegiorgioAmarina.pdf. It gives full coverage to the entire story and should be recommended reading for everyone. 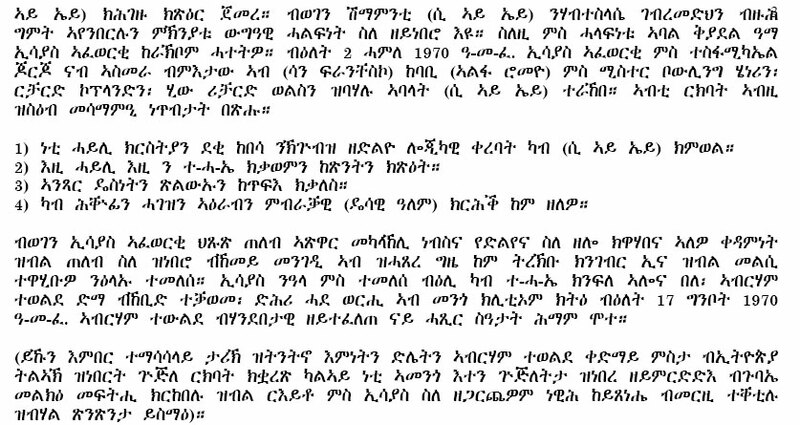 Amar(2004) states that Wodi Giorg , who was at the meeting with Issays and Col. Mamuzer Copland on 2 July 1970(note), had an interview with the local press in Addis which appeared in an Amharic newspaper called "Senay", volume 1 number 3 of February 1993. A short while later, Wodi Giorgio was shot dead in front of his Addis Ababa house in order to keep the meeting secret. Others who knew about the meeting at Kagnew Station, Habteselassie Ghebremedhin and Tweldeo Iyob were killed on the pretext of Menka; and Solomon Woldemariam and Haile Jebah also were killed on the pretext of the conflict with Yemen. The remaining founder of Self Nistnet who knew the story, namely Weldemichael Haile (note) was killed shortly after the victory of Segeneti in 1977 by an unidentified gunman. Tesfa Ytbark and Beraki were killed in the battlefield. The only survivor from the founders of Self Nitsnet was Asmerom, who has never wished to tell this secret to the public out of loyalty to Issays. Both Mesfin Hagos and Abdella Adem who were members of the Central Committee knew this story but since both collaborated with Issays in crimes against innocent fighters in the 1970s, I doubt that they will ever publicly tell the truth. 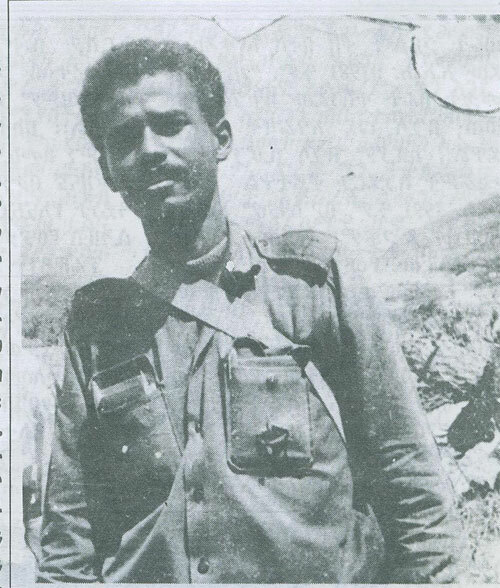 Only Haile Menkeros, who taught foundation politics to the new recruits at Beleqet military training camp in 1975, when the fighters were accused of being CIA agents could inform the public. He was also Ambassador to Ethiopia in 1993 at the time when Tesfamichael Giorgio was assassinated by the EPLF security. He arranged to return the body of Tesfamichael from Addis Ababa to Asmara. By and large, the Front systematically eliminated thousands of new recruits from among progressive Eritrean students under various pretexts in the 1970s., in contradiction to Issays’s proclaimed anti- Imperialism. This was well documented by historians and journalists who were experts in the Eritrean liberation struggle. According to Dan Connell (2003:271) in the 1970s. Issays insisted that American imperialism has been our enemy, is our enemy and will remain our enemy as long as it exists as an imperialist force in the world. Furthermore, in his 1984 interview with Adulis he also called the U.S an imperialist power which had exerted considerable pressure to destroy the Eritrean Revolution ( Adulis, 1984). Throughout the 1990s America considered that “Issays was one of the new generation" of African leaders who could preserve the USA interests there, through protecting Israel’s regional security, and combating the extremist regime in Sudan. The first step by the Eritrean government was to accuse Turabi of helping the Jihad in Eritrea, Ittihad in Somalia, and the Oromos in Ethiopia. (The Middle East magazine, 1995) Consequently, the Islamist regime in Khartoum began to distance itself from Eritrea and in 1995, the tension between Khartoum and the Asmara government grew worse, leading to the closing of the Sudanese Embassy in Asmara. In relation to the above, during Issays official visit to Washington in 1995, there was an agreement between Isaias Afeworki and Washington that the Eritrean military would be trained in US army camps This was in line with the aim to overthrow the Sudanese government. Ruth Simon (1997) reported that Eritrean soldiers fought alongside rebels in neighbouring Sudan. 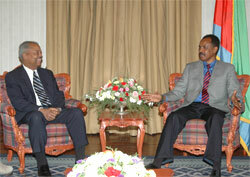 The escalation of tensions between the Sudanese and Eritrean governments served to strengthen U.S –Eritrean relations. On 4 May 1997, it was announced that the US was providing as much as $20 million in military supplies to the country (Timeline). This was due to the agreement reached between Issays Afework and Washington in 1995, and also to his great contribution in Laurent Kabila replacing Mobutu in Congo. After a year of the military assistance from the USA, Issays, to ensure his hegemony in the region, ordered the Eritrea Defence Force to occupy Badema on 8 May 1998, which caused the Ethiopian –Eritrean 1998-2000 border war. Despite the fact that Issays provoked the border conflict in May 1998, the following year he received honours from a US group for his leadership skills to end hunger, war and poverty (Visafrica, 1999). This was despite the fact that his conduct had opposed development, prosperity and peace by refusing to accept the U.S-Rwanda peace plan. 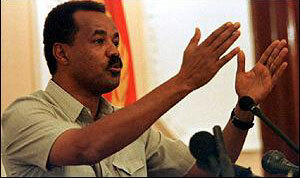 He had rejected it on the grounds that Eritrea didn’t have to raise its hands in surrender, indicating that he was not willing to end the war through peaceful dialogue. Thereafter, in 2001 he accused a member of the national assembly, who wrote a letter to him advising that Eritrea should accept the U.S-Rwanda peace plan, of being recruited by the CIA, a cover up for his humiliating defeat in the 1998-2000 border war . 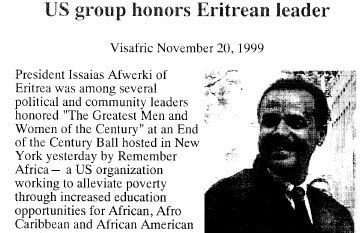 Despite the fact that there had been little criticism from the US, in 2007 Issays tried again to divert the attention of the international community from his dictatorial rule and internal problems by portraying the US as the "historic enemy of Eritrea”. This contradicted what happened five years earlier when he had asked the US to set up a military base. Regarding this Kidane, Megisteab(2005:181) added that Issays’s offer to devote Eritrea’s scare resources to help America fight global terrorism, at a time when other countries in the region were working hard to use their geopolitical position as a leverage to squeeze more American aid, simply exposed Issays’s utter desperation to secure the regime preservation with U.S military patronage. Eritrea President Issayas Afewerki accused US again in 2007"A plan initiated by the Washingtonadministration"
The US-Eritrean relationship has deteriorated not because the Issays regime is a dictatorship but because the United States has supported Ethiopian intervention and helped the Somali interim government. On the other hand the Eritrean government supported the Islamist insurgents in Somalia, which was in contradiction to Issays’s earlier attitude toward Islamist extremism. Issays has accused the US of an unjust and unfriendly policy in the Horn of Africa in 2007, he has never been a principled opponent of the U.S. In early 2008, during talks with US Congressman Donald Payne, he illustrated his hypocrisy by saying: “Eritrea wishes to improve its relations with the U.S"
In general, his hypocrisy of being Anti-American has existed for the last 40 years, and includes branding the US as the "historic enemy of the Eritrean people to manipulate and divert Eritreans from thinking about justice and democracy and to get support from them when he planned to crush dissidents. In fact he has betrayed the Eritrean people, more than anyone else since he has never wished to see a bright future for the younger generation of Eritrea. He has killed thousands of innocent young fighters under different pretexts accusing them of spying. His attitude towards the Eritrean people is no different from the former governor of Eritrea, Ras Asrate Kassa who said that he would leave Eritrea as bare as his bald head in 1967, just 40 years ago. Issays has still a desire for what he had in the mid-1990s to form a confederation between Eritrea and Ethiopia and to become the head of both states. Since he has this dream he has currently chosen to be allied with Kinjet (an Ethiopia opposition party which has never accepted the independence of Eritrea) in order to recreate a Greater Ethiopia. 1.Was the systematic purging of progressive fighters in 1970s related to the meeting between Issays and Col. Mamuzer. Copland on 2 July 1970? One of the points in that meeting was Self Nitsnet (the new force which was founded by Issays after the death of Abrham Twoldeo who had been against the talks with the CIA at Kagnew Station) This organisation worked strongly against communist and socialist influences within the front. By the mid 1980s the front gradually abandoned its leftist outlook. To find information about those who were executed in the 1970s by the Front and mentioned by Mengeisteab Kidane(2005:50) please visit this web page. 2. Rumours were spread in the Menkaa movement, in the 1970s, accusing progressive fighters of being CIA recruits and this tactic was repeated in 2001. Why does Issays always accuse his challengers of being CIA agents ? Is he trying to cover up his 1970 secret meeting with the CIA? 3. How is one to explain the recent antagonistic relationship of Issays with the US? Is it going to develop a new anti-US relationship or is it mere demagogy. In conclusion, the author appeals for the second time to all former members of the EPLF who survived the war, especially those who were in the Central Committee between 1977-1987 (Abdella Adem, Haile Menkerios, Mesfin Hagos and Andebrhan Wolde Giorgis ) and other senior post holders, especially members of the 72 ( the EPLF Intelligent Centre ) to tell the public the truth about the EPLF leadership’s crimes against innocent fighters. They should also break their silence about what they knew, concerning the conspiracy by Issays against the interest of the Eritrean people during their liberation struggle, and after liberation especiallyregarding to the proposal for the establishment of a confederation between Eritrea and Ethiopia and the development of relations between Israel and Eritrea. This had been a surprise for most EPLF fighters in 1993.
his 1970 secret meeting with the CIA in Asmara ? Navy already operates three similar submarines, capable of launching cruise missiles with nuclear warheads. Germany has agreed to sell Israel another two Dolphin-class submarines, They will join the three Dolphin -class submarines already operated by the Israeli navy, making Israel one of the premier maritime powers in the Arabian Sea. The new pair of submarines, like the first three, will be built at the Kiel-based Howaldtswerke-Deutsche Werft AG, the world's biggest builder of diesel submarines. The new boats are more advanced in that they will able to stay submerged for longer than the first Dolphins. The reported cost for the two craft is $700 million. Berlin has overcome its reluctance to the craft being fitted with nuclear cruise missiles, in the interests of a newly adopted more aggressive defense exports policy, and out of understanding that the EU's attempts to halt Iran 's nuclear weapons program is unlikely to succeed. The only thing that is clear to me is that the U.S.A., Eritrea, and South Africa are built and are found on CRIMINALS, from Europe, called Unwanted.these criminals OUT-SMARTED the globe ,except ERITREA!!! good luck my country. After the Zionist attack on Lebanon, the Sanaa-based Yemeni daily Al-Thawra published an interesting piece of information. It said that Israel had transferred three warships from its military base on Eritrea’s Dahlak Island on the Red Sea to support their military operations against Lebanon. Official sources noted that Israel is creating the biggest naval base outside Israel on the Dahlak Island. 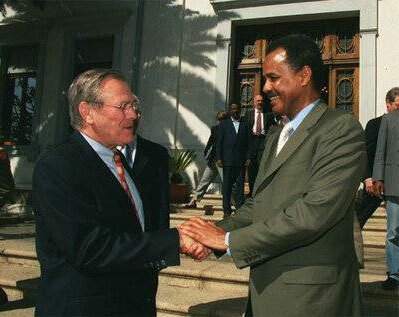 This followed an agreement between Eritrea and Israel signed in 1995. Eritrea used Israeli warships and huge logistical support from that naval base during its occupation of the Yemeni Hunaish Island in 1996. 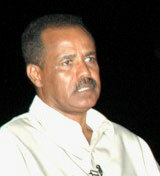 The sources disclosed that Israel has presence on two Eritrean islands: Dahlak and Fatma. The Israeli nuclear wastes are accumulated in these islands. Israel also has monitoring centers on the Red Sea to oversee the Kingdom of Saudi Arabia, Yemen, and Sudan in addition to oil movements. The Eritrean Foreign Ministry refuted the news item denying the existence of any Israeli base on their Islands. However, an intensive study carried out by the Center for Political and Strategic Studies and published by Al-Ahram in June 2006 titled “Isaias Afewerki’s Regime and Developing Relations with Israel” confirmed that the issue was much bigger than the Israeli military bases on Eritrean soil. It revealed a strategic relationship between the two governments that began with Eritrea’s President Isaias Afewerki traveling to Israel for medical treatment in 1993. 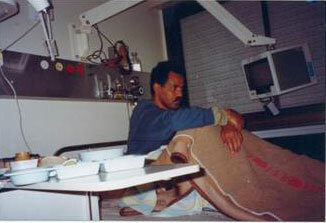 Afewerki was transferred to Israel by an American airplane. The US representative in the Eritrean capital Asmara was the one who suggested the idea after the Eritrean leader fell ill. These happenings along with American efforts led to the opening of an Israeli Embassy in Asmara in March 15, 1993 prior to the official announcement on April 27, 1993. There also has been an inclusive agreement between the two countries that was signed officially in March 1993 by Israel’s Prime Minister Yitzhak Rabin and Eritrean President Afewerki. According to the Center for Political and Strategic Studies’ report, Israel has some clear motives for establishing and improving ties with Eritrea. They wanted Eritrea to become the most important strategic ally to the Zionist entity in every corner of the Horn of Africa and the Red Sea. Their motives can be summed in two points: 1. The geostrategic importance of the 360 Eritrean islands, especially Dahlak and Fatma islands. They are located in the southern gateway of the Red Sea occupying some 1080 kilometers. The two islands have important features that affect the international and regional naval balance. The two islands can also be used for stationing marine and land forces and for monitoring all naval activities in the region. Israel thought that by controlling these islands it can avoid any Arab attempts to impose a naval blockade on Israel under any circumstances. Israel’s presence on the islands will also stop the Red Sea from turning into Arab waters. 2. Another advantage is the importance of Eritrea’s location in serving the Israeli strategies in motoring and spying on Saudi Arabia, Yemen, and Sudan. The three countries are not Israel’s allies. In 1998, the British “Foreign Report” bulletin, specializing in intelligence affairs, reported that Israel maintains close intelligence relations with Ethiopia and Eritrea, and that the Israeli spy agency Mossad has established in the Ethiopian capital, Addis Ababa, a center for gathering intelligence information.According to the British weekly, Eritrea permits Israel to carry out vast activities on Dahlak Island on the Red Sea. Because of the presence of the Israelis on this island, the Mossad can carry out monitoring operations and collect important information about Yemen and Saudi Arabia. The Foreign Report bulletin also stated that the Mossad has a very active intelligence gathering station not far from Eritrea’s borders with Sudan. Isayas was not only X-CIA agent, until 1998 he was X-Mossad Agent. Until 1998 were Israel-Marine in Massawa with middle-range Atombomb (U-Boat), to attack Iran. Erlich,(1988). Eritrea in the Western Media. Compiled by concerned Americans and Eritreans of the San Francisco Bay Area.